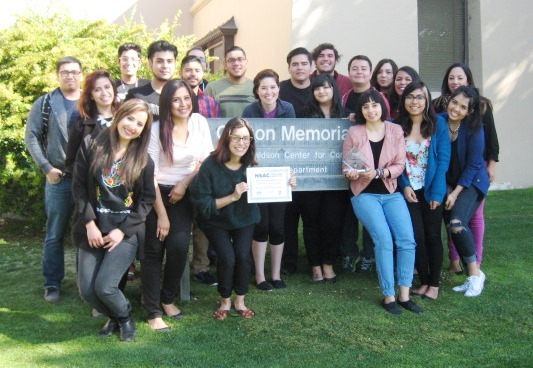 UTEP's Bilingual Journalism Training Program Borderzine receives one of the ’50 States for Good’ grants from Tom’s of Maine, from their community giving program. The grant is worth $20,0000 for the program at UTEP. Dr. Pineda’s for Texas Standard interview discussed Attorney Steve Fisher’s break up notice, and Fisher statement that El Paso has been isolated and neglected from the rest of the state. To hear the full Interview click link below, interview starts at 15:05. UTEP Professor of Communication Arvind Singhal was selected to present the 2015 Carroll Arnold Distinguished Lecture at the National Communication Association's Annual Convention. The lecture was delivered in Nov. 2015 at the annual convention in Las Vegas, Nevada, and the title of the presentation was "FLIP IT: How Complex Social Problems Can be Solved Simply and Communicatively by Looking for Positive Deviance." Link here for more information, and for access to video of presentation . UTEP Senior Ad Team Wins 2nd Place in National Advertising Competition in Phoenix. Spring 2015: UTEP Senior Ad Team took 2nd Place in the Pizza Hut Campaign at the District 12 National Student Advertising Competition in Phoenix. 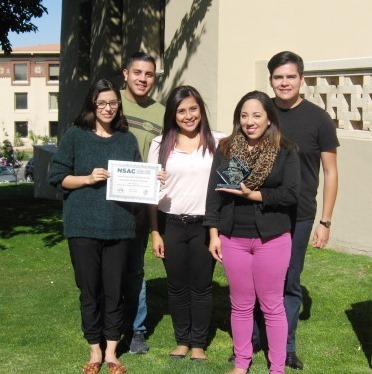 The UTEP team was selected as the " Best Presenting Team ," and Nancy Arellano as the " Best Female Presenter ." Our presenting team included (below, left-to-right) Lucía Romero-Salazar, Nancy Arellano and Alejandra Yerena, as well as (back row) Ricardo Segoviano and Oscar Franco. Outstanding Faculty Member recognition for Dr. Arvind Singhal. Based on his research productivity & excellence in teaching, Professor Arvind Singhal was selected as this year's Outstanding Faculty Member for the College of Liberal Arts. He was recognized on Thursday, April 16, 2015 in a ceremony on campus. 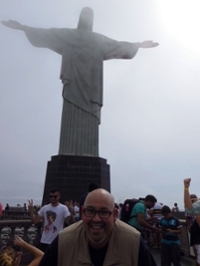 Dr. Richard Pineda Finds Redemption in Rio de Janeiro, Brazil. Image: Dr. Richard Pineda in front of Rio de Janeiro's Cristo Redentor statue ("Christ the Redeemer"). Prof. Pineda recently traveled to Brazil on behalf of the Department of Communication's partnership with the "Rare" organization. Click here for more information on the UTEP-Rare partnership . A new research article, "The Case of/for Communication (What Does It Mean to Study Popular Music?)" is the latest article by Prof. Roberto Avant-Mier, published in the Journal of Popular Music Studies . A new research article, "Environmental Justice in International Contexts: Understanding Intersections for Social Justice in the Twenty-First Century" is the latest article by Professor Stacey Sowards, published in the research journal Environmental Communication . Stacey K. Sowards, Professor of communication at The University of Texas at El Paso, is the recipient of the 2013 Distinguished Teaching Award from the Western States Communication Association (WSCA). The award recognizes individual faculty for teaching that rises above and beyond the craft of teaching to a sustained performance of excellence in pedagogy. Recipients incite intellectual curiosity in students, can inspire departmental colleagues, and make students aware of significant relationships between their education and the world at large.